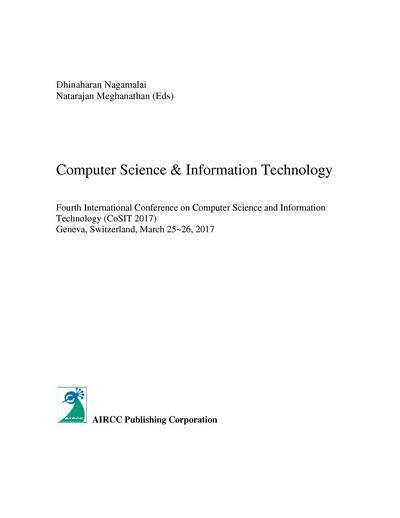 Natarajan and Dhinaharan wrote:The Fourth International Conference on Computer Science and Information Technology (CoSIT 2017) was held in Geneva, Switzerland, during March 25-26, 2017. The Fourth International Conference on Signal and Image Processing (SIGL 2017), The Fourth International Conference on Artificial Intelligence and Applications (AIAPP 2017), The Fourth International Conference on Cybernetics & Informatics (CYBI 2017), The Third International Conference on Cryptography and Information Security (CRIS 2017), The Third International Conference on Software Engineering (SEC 2017) and The Third International Conference on Data Mining and Applications (DMA 2017) was collocated with The Fourth International Conference on Computer Science and Information Technology (CoSIT 2017). The conferences attracted many local and international delegates, presenting a balanced mixture of intellect from the East and from the West. The goal of this conference series is to bring together researchers and practitioners from academia and industry to focus on understanding computer science and information technology and to establish new collaborations in these areas. Authors are invited to contribute to the conference by submitting articles that illustrate research results, projects, survey work and industrial experiences describing significant advances in all areas of computer science and information technology.